Pick this amazing Classic Cube Shaped Colorful Alarm Clock for the dearest people in your life to make them feel special and loved. 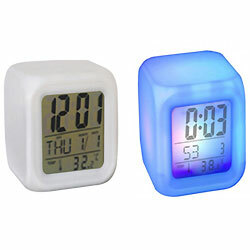 This cube shaped digital clock offers a sensitive touch function in addition to that you can see the time, date, day of the week and alarm time in this clock. The clock lights up for 30 seconds in a different colour.